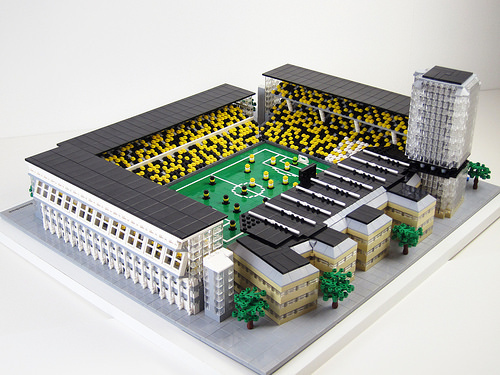 Gabriel (Lego.Skrytsson) has created this lovely soccer football stadium from his native Sweden. Sadly it appears this stadium will be demolished soon and replaced with office buildings, I only surmise that Gabriel built this 6800 piece recreation as a tribute to the former Swedish National Football stadium. While the exterior is great, and accurate to the real life stadium, my favorite bit was inside the stadium with the wonderful pitch and roaring crowd. Wow, now this is a really excellent micro creation! The detail is stunning, and it looks much bigger than it actually is! Fantastic find Simon!